The area of interest for this blog is tracking methane globally, and the use of satellite and ground station data to do so. The two main sources of satellite methane data are the AIRS and METOP/IASI satellite instruments. One fundamental question has been whether the satellite data collection was reliable at low levels in the atmosphere. A recent paper indicates that this is a valid assumption. As reported in phys.org, a team from "the Laboratoire Atmosphères, Milieux, Observations Spatiales (CNRS / UPMC / UVSQ) in collaboration with Belgian researchers and with support from CNES, using measurements by the IASI infrared sounder launched on board the MetOp satellite. Their groundbreaking results are published online on the website of the journal Geophysical Research Letters dated 17 January 2014." What they tracked, from December 2012 and into January 2013, was the trace gas pollution around Beijing and the North China plain, including the main air pollutants: sulfur dioxide (SO2), nitrogen dioxide (NO2), particulate matter, ozone (O3) and carbon monoxide (CO). What the researchers and the paper indicate is that the METOP/IASI sounder is "contrary to expectations, the IASI sounder is able to detect plumes of pollutants even near ground level as long as two conditions are met: weather conditions must be stable, which leads to a build-up of pollutants at ground level, and there must be a significant temperature difference between the ground and the air just above the Earth's surface. 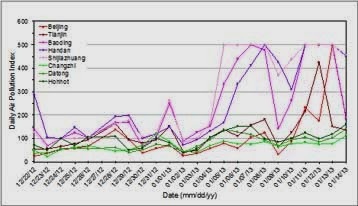 In January 2013, IASI measured very high concentrations of anthropogenic pollutants such as CO, SO2, ammonia (NH3) and ammonium sulfate aerosols over Beijing and neighboring cities. The IASI infrared sounder thus proves to be well suited to monitoring these pollutants in such conditions." What is substantiated by this paper is that METOP/IASI is useful for measuring pollutants in other geographic areas and globally and is able to measure of global methane release and measurements through the troposphere.